Deciding between the many techniques and materials that I love to work with seemed impossible…fabric, paint, collage, decoupage and shells. So I thought, why not incorporate them all into one fantastical design? My golden ox will step out of a happy dream. 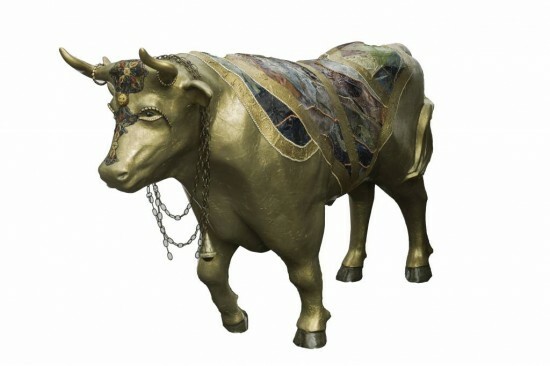 This Bohemian bovine is vibrantly covered with exotic fabric…highlighted with beads tiles and trimmings... topped off with a few other special accessories and flourishes. It’s possible a few more intoxicating and fantastical ideas will come to me in a pleasant dream yet to come.